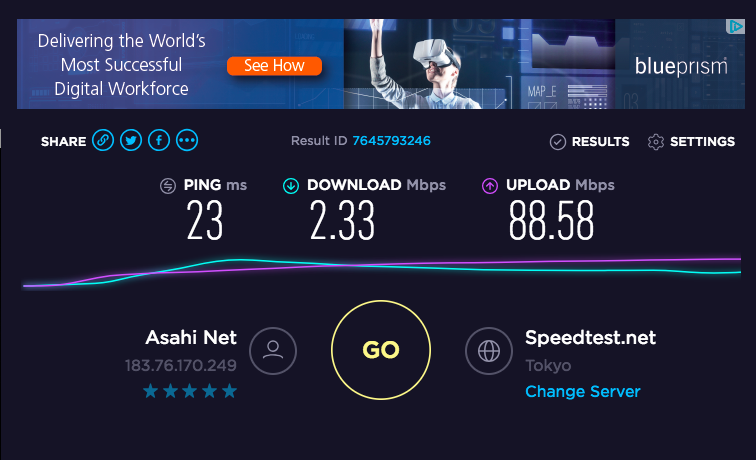 Ask 10 people and we’d bet you 10/10 wouldn’t associate Tokyo with slow internet connection speeds… The internet connection speed at Tokyo game show was a disaster. Throw 1/2 a million internet users into a box with Free WiFi and sure the internet speed will go down, but we weren’t prepared (mentally) for the sluggish crawl we were hit with at Tokyo Game Show 2018. (Luckily we were prepared technically, which is why we were able to upload all the cool footage we did as the event unfolded). Technically speaking, there was an underground Press Room where the WiFi was much faster, but that required us to leave the show floor grounds just to upload which was something we at least were not prepared to do! Too many cool things to look at! Heading back to the hotel (which was physically connected to the event hall via a walkway) we started to experience a similar sort of lag, so we decided to take a speed test. These were our results.